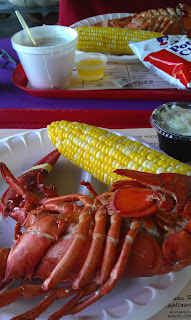 $19 for a 1 1/2 pound lobster, corn on the cob, cole slaw and chowder! A beautiful afternoon at the shoreline. I baked 10 dozen Chocolate Chip Cookies tonight! Gee you'd think a cookie monster or two were visiting this week! I am so jealous, I would love to have eaten this lobster what a feast! My favorite, I would be happy on an island with just lobsters and crab yum!